What Company Made The Fan? How Much Does The Fan Cost? Why is a Whole House Fan Better than an Attic Fan? Well, if you would like to save some money during the next heat wave, you may want to invest in a whole house fan, a great alternative to the conventional air conditioner. Whole house fans have been around for more than a century, and though they have been supplanted by air conditioners over the last few decades, they are now making a comeback. This is because unlike air conditioners, whole house fans use very little power, and still manage to keep your home cool during the summer. There are not many whole house fan reviews out there to advise you and give you the information you need to select the right product, which is why this review was written. We will outline some of the best fans you can buy, and give you a few handy tips on what you need to look for when buying a whole house fan. The QuiteCool QC CL-4700 is by far one of the best whole house fans you will find on the market today. Not only does it provide you with anything between 50 and 90% savings on your power bills, it also is one the quietest units you will ever buy. This is thanks to the patented acoustical ducting system that gives 6 feet of space between the ceiling intake grill and the fan motor head. Giving this much space means that you will barely hear the fan, even when you are in close proximity to it. 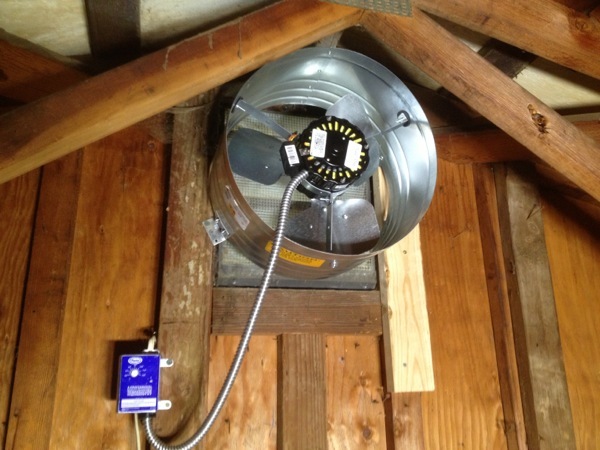 Installing this unit in your attic is relatively simple, and you will not need to worry about calling a professional to do it for you if you follow the easy instructions that come with the fan. The QC CL-4700 is very powerful, and is capable of speeds of 4757 CFM (cubic feet per meter) on high and 3586 CFM on low speed. This makes it ideal for homes that are anywhere between 2000 to 2800 sq ft, though there are users with homes as large as 3000 sq ft that have said that the fan still does a fine job. However, there are a few downsides to owning this fan. For instance, though installation is simple, you are going to need to have some prior knowledge of wiring as connecting the fan as a 2 speed unit is a little tricky. It is also quite large, so fitting it in your attic may be a little tricky if you do not have the space for it. There are also have been a few issues with the aluminum fan blades, which have split or broken in some units. Ideal for homes up to 2800 sq ft. If you are looking for a whole house fan that will not set you back financially but is still able to handle the job well, then this is the fan for you. The QC CL-3100 is one of the best fans you can get if you are looking to lower your power bills, and will help you cut you’re A/C power bill by up to 90%. It is able to do this while still having enough power to cool a house that is up to 1500 square feet thanks to a fan that can draw 3190 CFM. It is by far one of the most popular fans on the market right now thanks to its quite operating volume, which is possible thanks to QuietCool’s patented acoustical ducting system that gives 6 feet of space between the fan motor-head and the intake grill inside the house. The elimination of the noise means that you will even be able to sleep in the same room as the fan, which is useful if you decide to install it in a bedroom. One of the best things about this fan is the easy installation, which takes about 2-3 hours depending on your proficiency. The hole that is needed is 18 x 13.5, which means that it will fit easily between your typical 16” studs. Should you want to install it vertically, you can purchase a vertical adapter separately for a pittance. There are some downsides to owning this fan. Firstly, if you are installing the fan by yourself you are going to be careful about how you do the wiring, as setting up the two speed function can be a little tricky. Also, it does not come with its own remote control, therefore, you are going to have to buy an additional switch and remote control system if you would like to operate this remotely. Finally, unless you have more than 3 feet of clearance between the ceiling and the roof ridge in your attic, you are going to have trouble installing this unit. The QuietCool QC CL-1500 is an energy efficient whole house fan that is ideal for bedrooms and smaller homes. It is able of pulling up to 1527 cubic feet per minute of air, making it perfect for cooling spaces between 600 to 1200 square feet. All QuietCool products are made in the USA, and help give you the comfort of knowing that you are getting a quality, homemade product. When it comes to features, do not think that just because this is a small unit that QuietCool have scrimped on it. It still comes with the same patented acoustical ducting system to ensure that it runs quietly, and regardless of where you install it, you will barely notice that it exists when it is running. Perhaps the best thing about this fan is the fact that it can cut your costs by up to 90%. This is because it needs only 61 watts of energy to run, which means it draws less power than even some light bulbs. Despite all this though, there are a few downsides to owning this unit. For instance, there have been a few complaints about its reliability, with some customers complaining that the fan tends to give up after a couple of years. there have also been complaints about the mounting of the fan blades, which can sometimes be mounted off center, meaning that you are going to have to fix them yourself before you can use it. If you are new to whole house fans, there are certain things you are going to want to know before you purchase your first fan. The company that made your fan is very important. One of the main reasons to consider the company that made your new whole house fan is the company reputation. For instance, you will have noticed by now that all the fans in this review are made by the same company, QuietCool. This is because for the last few years, Quiet Cool has been an industry leader when it comes to whole house fans, and very few companies can match the power and quiet that these fans can manage. Many whole house fans are so loud, and vibrate so much that you may think that they are trying to bring the house down. 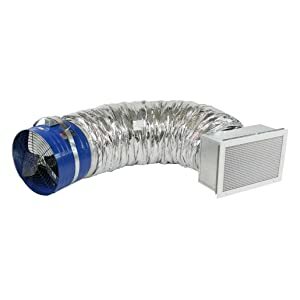 However, Quiet Cool whole house fans are specially designed to minimize vibration and noise, ensuring that you barely notice they are there even when they are running on maximum power. Whenever you are making a purchase, one of the most important things to consider is the cost of the item that you are purchasing. When it comes to cooling your home, there are a range of air conditioning units and whole house fans that you can choose from. However, whole house fans usually cost anything between $500 and $1100 dollars less than their air conditioning equivalent. Usually, when you are purchasing a whole house fan, the cost will dictate the power of the fan that you will get. Generally, cheaper fans are less powerful, however, price may also dictate something else, such as the quietness of the unit or how reliable it is going to be. That is why it is important to do proper research before you buy a whole house fan, regardless of the price. 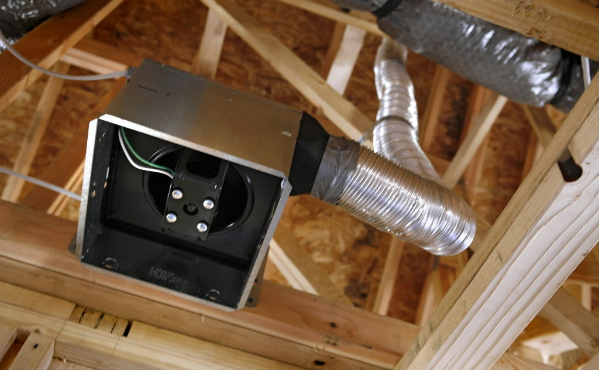 Whole house fans and attic fans usually compared to each other because they are usually both installed in the attic. Fortunately, that is the most significant similarity between the two, and they share many differences. However, the most significant difference between the two is with the way they treat hot air that is trapped in your home. Attic fans work by sucking out the hot air that is in the attic, and exchanging it with cool air from outside. 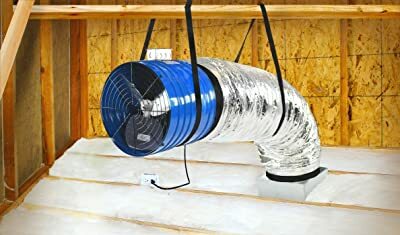 This helps to cool the attic and areas around the attic effectively, but it does not work for the whole house. However, whole house fans force hot air from the whole house into the attic, and then exchange that air with cooler external air, helping your home or room to cool in minutes. How many blades does the fan have? Is the fan isolated from your home’s frame? The more separation you have between the fan and your home’s frame, the less vibration you will experience and the quieter the fan will run. Isolating the fan from your home’s frame is simple, and involves using rubber mountings or even foam strips to help give you a barrier between the house and the fan. Using rubber or foam will also help to minimize the amount of sound that bounces off the walls and the frame of the house. Is the frame durable and welded? When you are purchasing your air conditioner, always check if the frame is welded, as this ensures that you are gaining the highest quality product on the market. Welded frames last longer, and can put up with a lot more abuse than may appear. Are the shutters of good quality? Just like with the frame, you have to ensure that you are getting the highest quality shutters as well. The better the quality of the shutters that you get, the less chance there is of the shutters thumping when they close. High quality shutters are also self sealing and insulated, meaning that you will have less cold air escaping from the house when you are not using the fan. If you get a whole house fan, remember to get a timer installed rather than a thermostat. Timers are always better when it comes to ensuring that the whole house fan does not come on at the wrong time. If you install a thermostat instead, you could end up having the fan come on at any time, even when there is no one in the home. Once you have bought your whole house fan, you are going to want to have it installed. There are a few installation options that are available to you when you buy your fan. The first and probably the cheapest option is for you to install the fan yourself using the instructions that come with the unit that you purchase. This may seem like the best option you have at your disposal, however, it can be quite tricky to install a whole house fan, especially if you have a fan that runs on two or more speeds. It can also be very time consuming, with installation times averaging between 2 and 3 hours. The second and easiest option you have is to have a professional come and install it for you. There are various companies that can do the installation for you, and depending on where you are in the country, installing a whole house fan can cost anything between $150 and $500, though prices can get as high as $1000, especially if you have to install additional roof vents. However, there are many things that will affect the cost of the installation of your house fan. For instance, the size of the fan, what type of motor it uses, the type of mounting the fan comes with, and the overall finish quality that you get or desire. The more any of these characteristics increases, the more you will have to pay. For instance, if you have a large fan with insulated winter closure, an automatic ceiling grill and a pull chain switch, it will cost you more to install the unit than it would to install a large fan with a 2 speed wall switch and a ceiling grill. Another thing you need to consider when it comes to the installation of whole house fans is taxes. There are some cities and states that will actually give you an energy rebate if you install a whole house fan. This is because it is estimated that whole house fans use just 10% of the energy that air conditioners use. In fact, according to the Sacramento Municipal Utility District, whole house fans use so little energy that they are able to pay for themselves within a few seasons. Installing a whole house fan is easy, and usually the unit that you buy will come with a set of instructions to help you install it in a quick, hassle-free way. With many of these installations, you will not even have to make any modifications to your ceiling if you pick the right place. The first thing you should do is attach the fan template to the ceiling. This is a cutting guide that usually comes with the fan that makes it easier for you to choose the right location for your fan before you actually start cutting into your ceiling. It ensures that you make no mistakes when laying out the location for your ceiling louvers. You can use a drywall saw to cut into the ceiling once you have gotten the right location. Just ensure that you use the template as a guide (the easiest way to do this is to ensure that the template is fixed to the ceiling in some way, whether with tape or tacks). Once you have cut into the ceiling, remove the panel that you have just cut and roll the insulation around the opening out of the way so that you can access the opening better. Once you have installed the fan, you can then roll the insulation back in place and trim it so that it presses against the sides of the fan frame. Once you have done this, place the fan frame in position over the hole in the dry wall. The fan will then (normally) be held securely by a couple of brackets that are screwed into the joists. Many fan brackets will align the fan over the center joist to make the placement of the fan easier. Once you have put the fan in place, you need to seal all the openings between the joists that you can see. Most fan kits will come with spacing material to place in between those gaps, which is usually nailed into the panels of the fan. However, you could seal the spaces even better if you added a sealant between the panels and the joists to ensure that the fan stays in place when you switch it on. Finally you can place the louvers in the hole at the bottom of the fan and secure them into the hole in the ceiling. Once you have done this, the only thing that should be visible from downstairs is the louvers of the fan itself. These are very basic installation instructions, and you may need to do a little more carpentry depending on where you choose to install the fan. Whole house fans are by far the best alternative you can get to a central air conditioner. They are quiet, energy efficient, and easy to install yourself. Not only that, but in some cases, they do even better than AC units when it comes to cooling the whole house. Now that you have read this review, you should be ready to start doing some research into which fans you can get. Just remember to keep all the considerations listed above in mind, and you should be on your way to having a cool summer.